"I, N..., a faithless sinner-renew and ratify today in thy hands, O Immaculate Mother, the vows of my Baptism; I renounce Satan, his pomps and works; and I give myself entirely to Jesus Christ, the Incarnate Wisdom, to carry my cross after Him all the days of my life, and to be more faithful to Him than I have ever been before." 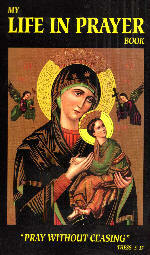 "In the presence of all the heavenly court I choose thee this day, for my Mother and Mistress. I deliver and consecrate to thee, as thy slave, my body and soul, my goods, both interior and exterior, and even the value of all my good actions, past, present and future; leaving to thee the entire and full right of disposing of me, and all that belongs to me, without exception, according to tby good pleasure, for the greater glory of God, in time and in eternity. Amen."